Among the easternmost Celtic tribes in Germania, the Lugii lived in the area which today roughly forms the meeting point between eastern Slovakia, southern Poland and western Ukraine (an area which was later known as Galicia). The Lugii may also have resided farther north, in Pomerania, prior to moving south (but should not be confused with the Rugii who resided in the region by the first century AD). Southwards migration was common, even normal, among tribes of the Baltic Sea region. The Lugii were bordered by the Gaulish Cotini to the south, the Venedi and the Vandali to the north, and tribes such as the Boii, Harii, Hermunduri, Naharvali, and Osi to the west. Controversy exists as to whether particular tribes were Germanic or Gaulish (Celtic), and the Lugii are one of those tribes which may straddle both definitions because they were a tribal confederation rather than a single tribe. The subject is discussed in greater detail in the accompanying feature. As well as forming a federation of their own, the Lugii seem to have been viewed as being part of the great confederation of the Suevi. 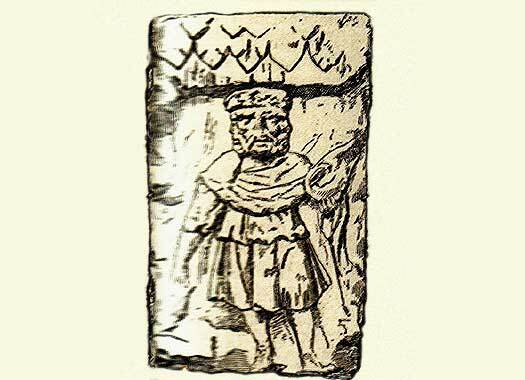 The Lugii name, also used by an insular Gaulish (British/Pictish) tribe in Scotland, appears to have been based on the name of the Celtic god, Lugus (correctly in common Gaulish this should have an '-os' suffix, 'Lugos'). He is more commonly known as the Irish Lugh or Lug (probably cognate to the Latin 'lux', meaning 'light' - it is possible that this god shows up in the Nordendorf fibula as Logathore, probably also cognate with the Norse fire giant, Logi). In northern Iberia a sub-tribe of the Astures carried the name Luggones, and nearby were the similarly named Louguei sub-tribe of the Gallaeci. These should probably not be regarded as branches of the central European Lugii, but instead as either fellow adherents of the cult of the god Lugus, or followers of a tribal leader named after Lugus. Confusingly, the easternmost Lugii also seem to have been known as Luggones, while there were several named subdivisions of Lugi (see AD 140s, below). With the Mugilones tribal name, the suffixes can be removed straight away to leave 'Mugil'. Even the surviving '-il' could also be a suffix, one that is often seen as being Celtic. In Latin it is 'mugio', meaning 'to groan', or bellow, roar, low. Could that make this tribe 'the shouters'? The proto-Celtic word list provides *glagmā- (? ), meaning 'shout', which looks like an inversion of sequence, something that was not uncommon. Breaking down the Sibini name requires using Irish Gaelic for cognates. A possible origin is 'seabhag', meaning 'hawk, with the Irish version being 'seabhac', Early Irish 'sebac', and Old Irish 'sebocc', but the end 'g' or 'k' sound is missing. Another option is with the loss of the 'r': 'siabhrach', meaning a fairy, in Irish 'siabhra'. Early Irish has it as 'siabrae' or 'siabur', meaning a fairy or ghost, in Welsh this is the 'hwyfar' in Gwenhwyfar (Guinevere, meaning 'white fairy'): *seibro-. This has a parallel in the Picts of Fife being called the cusidhe (fairy hounds). So were the Sibini 'the faeries' (to use the more traditional spelling of the word)? The pure, unadorned word makes no sense: Irish 'sibh', meaning 'you', Old Irish 'sib': *sves, for 's-ves'. The 'ves' is allied to the Latin 'vos'. The form 'sibh' is for *svi-svi. A guess based on all of this is that these people were 'the faeries' in the traditional sense (not the Hollywood sense! ); flighty, hard to pin down, semi-spectral. The Zumi tribal name is particularly fascinating because it does not look either Celtic (which would hardly use a 'z') or Germanic. If it does turn out to be Celtic (which seems dubious) then it looks like slang in the form of 'tzu' (the modern 'tu' which means 'you') plus 'me' or 'mi' (which equals the personal pronoun 'I'), in other words, 'you and I', a particularly odd way of saying 'us' or 'we'. Of course, this is highly speculative. At least some early elements of the Lugii probably belong to the Hallstatt culture of Celts, along with the Bebryces, Boii, Cotini, Harii, Helisii, Helveconae, Manimi, Naharvali, and Osi. They are to be found around the central German lands, and in Bohemia, Moravia, Slovakia, and the edges of Poland and Ukraine. Around this time a large-scale expansion begins that sees many Hallstatt Celts migrate outwards, towards northern Italy, Gaul, or Iberia. Many others remain, and control the region until pressure from newly-arriving Germanic tribes begins to erode their hold in the second and first centuries BC. Migrations of Marcomanni from the region of northern Bavaria and the River Main lead them to the homeland of the Boii in Bohemia. The Marcomanni leader, Marbod, forms a confederation of tribes which includes Langobards, Lugii, Marcomanni, and Semnones, and the Boii themselves. Possibly this also incorporates remnants of the alliances of Ariovistus of the Suevi in 58 BC. At this time the Lugii are probably contributing to the Przeworsk culture of central and southern Poland. The first historical mention of the Lugii is by Strabo, who seems to place them as members of a tribal federation which includes the Butones (a questionable name, perhaps a misspelling of Gutones), Mugilones, Semnones, Sibini and Zumi. Of those, the Mugilones, Sibini, and Zumi are otherwise entirely unknown, with this perhaps being the last gasp of any separate identity for them before they are entirely subsumed within the Lugii confederation. The Lugii are mentioned by Cassius Dio in his Roman History. During the reign of Roman Emperor Domitian the 'Lygians' in Moesia, having become involved in war with some of the Suevi, send envoys asking Domitian for aid. He grants them a force of a hundred warriors, 'a force that was strong, not in numbers, but in dignity'. The Suevi, indignant at this help, attach members of the Iazyges to their number make preparations to cross the Ister with them. What happens next remains unrecorded. At this time, the Roman writer Tacitus mentions the Lugii. He is of the opinion that they are a federation of the smaller Gaulish tribes, the Harii, Helisii, Helveconae, Manimi (perhaps a division of the Lugii themselves based on Ptolemy's comments of around the year AD 140), and Naharvali. Tacitus also mentions the Buri but not as members of the Lugii. The Vandali, who neighbour the Lugii to the north-west, may also be allied to the Lugii in some way, either as part of the same people or as part of their federation. Ptolemy breaks the Lugii down into Lugi Buri, Lugi Diduni, and Lugi Omani. It seems plausible that the Manimi of AD 98 have some relationship to the Omani, based on the similar names. The Diduni have an especially intriguing name because Ptolemy names a town in the area called Lugidunum. This name breaks down into Lugi (the Celtic god) plus 'dun' (fort) and '-um', which is a superfluous Latin suffix that can be ignored. Diduni breaks down into the prefix 'di-' (which seems to be cognate to a related Latin prefix of 'de-', and means 'of', 'from', 'down from', or 'originating from') plus 'dun' (fort) plus the added Latin plural suffix '-i'. So the Diduni would be 'from the fort'. Ptolemy also lists the tribe mentioned above called the Lugi along the Moray Firth in what is now northern Scotland. While it is possible they are related to the Lugii of central Europe, this is unlikely, and they are more likely to be a tribe of adherents to the cult of Lugus. The Byzantine historian, Zosimus writes his Historia Nova (New History) in this period, which contains the last certain mention of the Lugii. The Eastern Roman emperor terminates several other wars relatively easy and fights some fierce battles, first against the Logiones (Lugii), whom Zosimus calls Germanic. The Logiones are defeated in the field, with their leader, Semno, and his son being taken prisoner. They are all pardoned once they submit, but all their captives and plunder are confiscated and both they and their warriors are sent home on the emperor's terms. Possibly the only chief or king of the Lugii to be recorded. Unnamed son. Probably succeeded Semno. The final fate of the Lugii is unknown. Given their location it seems possible that they are absorbed by Slavs migrating west into central Europe. As is often the case when a population is subsumed within a new group, they probably adopt the language and tribal affiliations of their new overlords in order to blend in and be accepted (there are various instances of this in Britain). The existence of Celts in southern Poland and western Ukraine after their heyday is proven by the emergence of a region known as Galicia, which bears a version of the original name for the Celts.